The third Ninja Tune Forum Remix Chain, Toastboat, is now online. 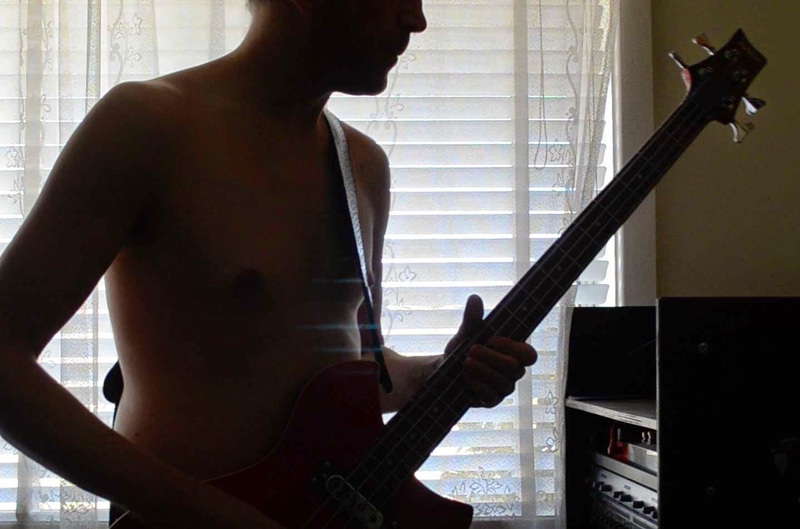 There's definitely a style emerging in my recent tracks, driven by bass and filled out with reverb. This latest track for the Naviar Haiku project is in that vein but with faster percussion. The opening synth reminds me of Aphex Twin's ambient work. The rest of it is kinda a remix of Rapture of the Raptor, another Naviar Haiku track. The Assignment: Take a track and its remix and meld them into something new. This is the next to the last project of 2014. It’s a remix of a remix, and of the track the remix was based on. This week I opted for a dub sorta track as there seemed plenty of bass material and reverb seemed an obvious choice too. Reverb is an effect I've really come to love through the Junto. There's definitely a bit of a Pole vibe, although I think the hats could be better. Usually I find my remixes benefit from a few drafts but with this track I only did the one. I created a few short loops, alternated them and then set about trying to develop a rhythm. The loops are sent to the reverb buss at different points, which creates a bit of variety in the background. The hi-hat comes from the Colab remix, as does one of the subby sounds I think. The rest of the sounds come from the original track. The bassline was a late addition, I like the progression it adds. Heard some great mixes this year, particularly via FACT (Luke Vibert and Stephen O'Malley were both contenders) and Solid Steel (mostly their archived sets, TBH). 2014’s been a great year for my music with radio airplay and a bunch of releases. Listen above for my preemptive strike on the annual Junto activity of stitching together 12 five-second sections of audio to represent the year. It started with an appearance on New Weird Australia’s Regional, Rural and Remote compilation in January, along with tracks opening and closing Shinobi Cuts’ remix chain. In between those two songs the material travelled around the world and there are some fascinating interpretations. The Reimagining exhibition traveled to Wagga Art Gallery in February and it was pleasing to hear part of my soundtrack broadcast on Radio National during April. In March a track I recorded in Wagga one afternoon joined the Album In A Day release. During April I tried remixing The Occupants. In May an impression I made of a pelican using a balloon joined 152 other musicians in the Bimblebox exhibition, which will travel through regional Australia until 2016. June featured a trip to Lismore, where I recorded Mike and Cameron (see video below) -- the latter's sculptures would feature on my album AND. 2014 was a year of anniversaries, including a decade since the release of my first album SHAKES and 25 years since I started playing bass guitar. A recording with my bass playing from 1994 became part of my contribution to Garlo Jo’s Vent De Guitars CD in 2014. My presentation on DIY Communications at Dream Big in August drew on my experience promoting creative projects. In September I released AND, a 20-track album with songs made from sculpture, a playground, story time at Leeton Library, a boiling kettle, wind chimes, as well as regular instruments. It’s my eighth album as Bassling. One track is a song I wrote about the rise and slight drop in temperature during a day in January. It was part of the Regional Arts Australia summit in Kalgoorlie during October -- the month in which I also finished the track in the link here. An exhibition opened in London during November that included a song made from the sounds of my suburb Willimbong. 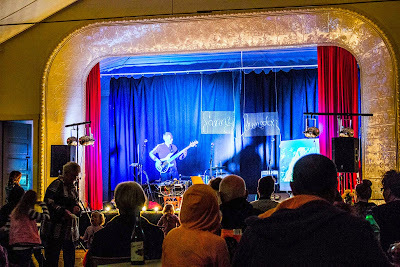 During that month I also manipulated a recording of Leeton’s main street during the Outback Band Spectacular, which was another fun project proposed by the Disquiet Junto. I’ve now participated in over 80 Juntos, including videos for more than 20. This month I made a mix and was invited to write for a friend’s blog and used the opportunity to explain how I came to embrace the musicality of noise through living in regional Australia. I’m looking forward to starting 2015 with the release of the third remix chain and a video project with the poet Derek Motion. 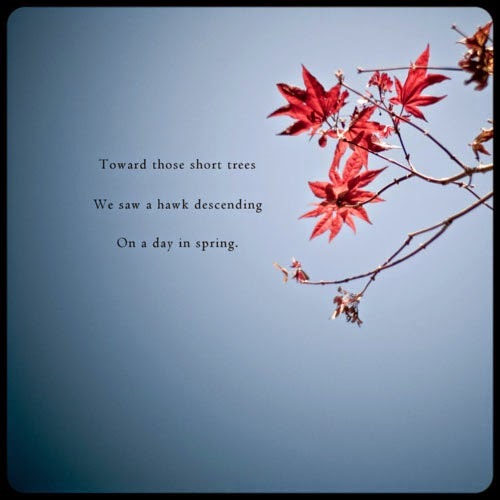 It's stormy at home at present but not wintry, so the Naviar haiku isn't really resonating with me. This track continues my current interest in recording basslines and then applying the Audio Damage Replicant effect, using the Four Bar Repeat preset. It's a process I also used for the last Naviar project. The bassline was one I recorded for a friend, then started experimenting with looping. It's quite fascinating the way repeating a part works so beautifully with a simple kick/snare drum beat. This week the Disquiet Junto draws on the short loops created last week, alternating between two and then introducing additional parts. My piece opens with Unclearly So then 0153groovelock before drums, electric bass and Oddity2 VST synth. I'm not sure the groove is locked in this track. The drums don't seem right. The blog Music Of Sound chided me recently for mixing up the words 'sound' and 'noise'. 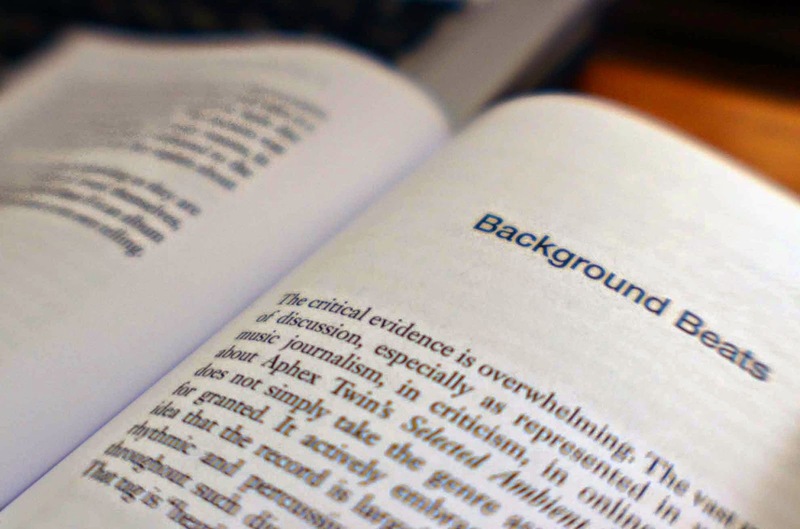 "In my book, a noise is an unwanted sound," wrote blogger Tim Prebble, citing examples "signal to NOISE ratio, NOISE polution, NOISE floor"
I guess it makes sense to think noise is bad and sound is good but it's not the way I think about audible material. The distinction seems to be a value based on subjective experience. A noise might be unappreciated as sound one particular moment. If I'm making a recording, then maybe I have some control over the role of noise among the sounds I curate. But, do these decisions make me a noise snob? 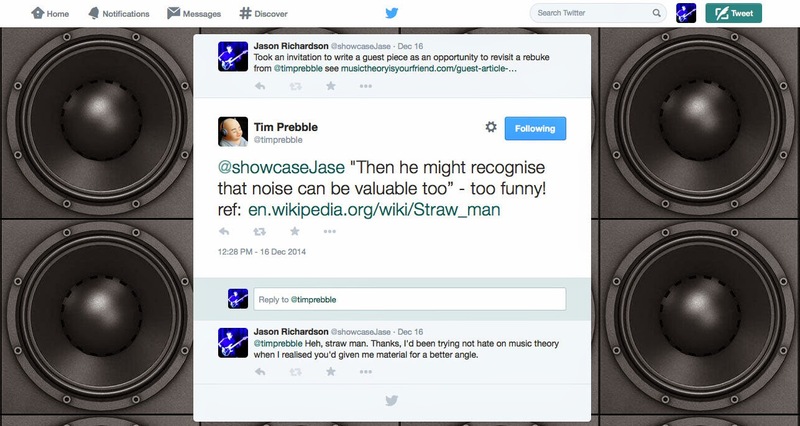 So, I asked Tim "What do you make of the term ‘noise’ as a genre?" I used to hate all that noise. 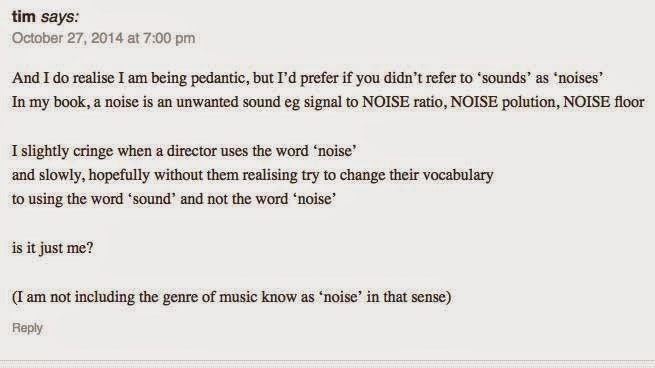 "(I am not including the genre of music know as ‘noise’ in that sense)" he added to his reply, which is a shame since I was attempting to deconstruct the binary logic of his terms. Then he might recognise that noise can be valuable too. About decade ago I had definitive 'A-ha!' moment when I couldn't sustain the distinction between noise and sound. I remember going along to a few of the Wagga Space Program's Unsound events and found myself annoyed by the 'noise' artists who'd play an interesting field recording or other ambient sounds and then interrupt it with white noise. The contrast between a soothing sound and a loud noise was interesting once or twice, particularly as texture on a large sound system. After a couple of artists did it during their sets, it seemed like a 'noise' artist cliche. It lead me to realise that it was context that made this noise noisy, since I could enjoy it at other times. There are plenty of times when music becomes noise. Being jolted awake by loud music, like an alarm clock, is one example of music becoming noise. The way music is used during siege settings or interrogations must also make them seem noisy. Anyway, I stopped thinking how much I hated 'noise' art and began questioning what else my subjective experience might be stopping me from experiencing. Then I learned that noise could be as interesting as music. The Wagga Space Program had a cool philosophy that being based in regional Australia was a key part of their sound. It started to make a lot of sense to me when I was introduced to Alan Lamb, whose large-scale aeolian harp he calls 'the wires' changed the way I listen to sound. Lamb's wires had been installed outside Wagga Wagga during 2004 and I spent many hours listening to their shifting harmonics. The sound varied from test-tone-like hum to softer breathing as the wind caressed barely-audible vibrations. Lamb also introduced me to piezo contact microphones. Recording with these captures vibrations directly, rather than the vibrations in air captured with a microphone's diaphragm. It's quite cool to think you're hearing how something feels. 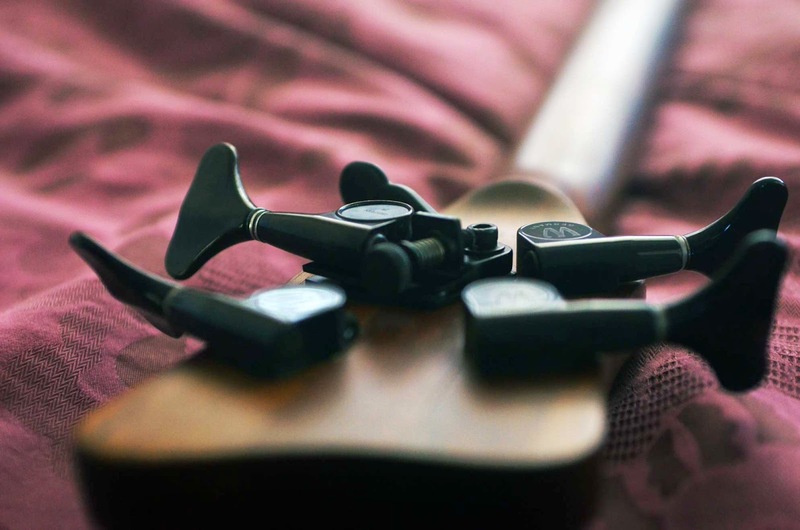 Contact mics can also transform objects into instruments. Like the fence near the playground at the end of my street that makes an evil double bass sound when there's a strong westerly. 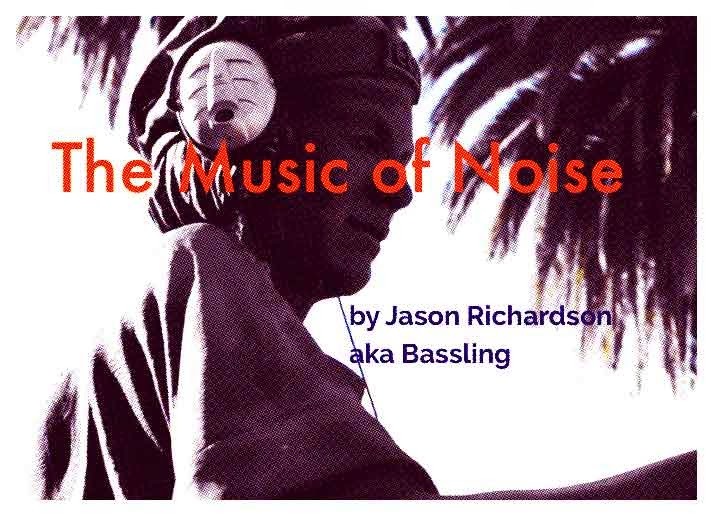 Once I began thinking of how to use environmental noise in musical remixes, the difference between noise and sound became a question of frequencies. It brought into focus the physics of a situation in determining the value of a sound in my composition. A piece at the Wired website explains that the main harmonic overtone heard (other than the octave above) when striking a physical object is a fifth to the fundamental tone. It has an inherent chord within the sound but the resonance of different structures can filter the result. This leads sounds to vary within different corners of large metal objects like slippery slides. I've been amazed at how much variety you get tapping different parts of a slide. Tapping in various places produces different tones. Like the piping along the sides, the ladder, the sheet that forms the slide part, etc. Not every sound will be musical, some might even be called noise. It probably depends how I'm feeling that day whether I'm feeling a particular sound but plenty find their way into my recordings. My 2012 project For 100 Years embraced the idea of noise being musical and drew on the Italian Futurist movement, in part because they were active at the time of Leeton's construction. 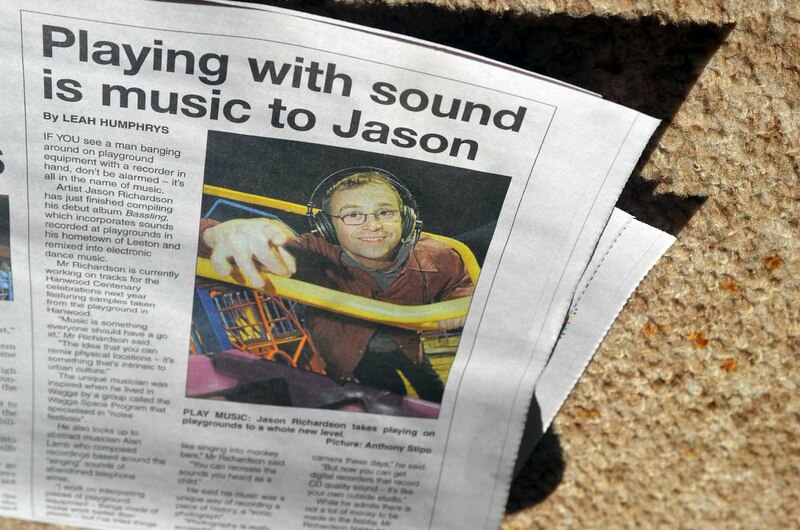 The local newspaper sometimes use inverted commas around the word "music” in reference to my material. Maybe I'm sensitive to irony but I wonder if some are still getting accustomed to how the concept of music was challenged in the 20th Century by the idea promoted by John Cage that noise and music overlap in sound. I was a musician before moving to regional NSW but being here has opened my ears to the landscape. Alan Lamb's work can only really exist in a regional context. 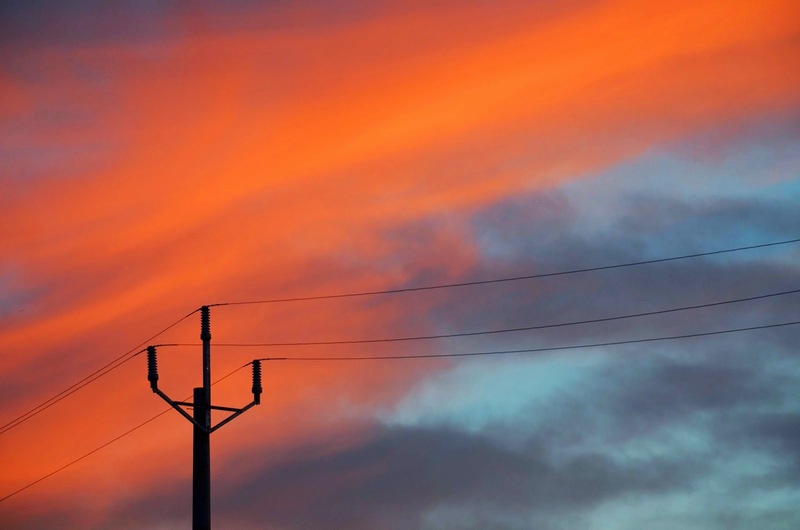 The interplay between the surrounding sounds like birdsong and his wires really captivated me. 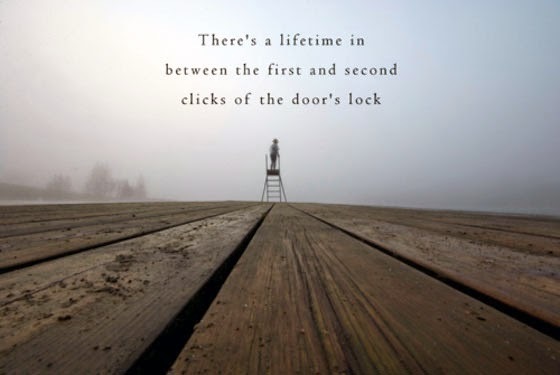 I spent many hours listening to the long decay of chirps as well as the rise and fall of harmonics. 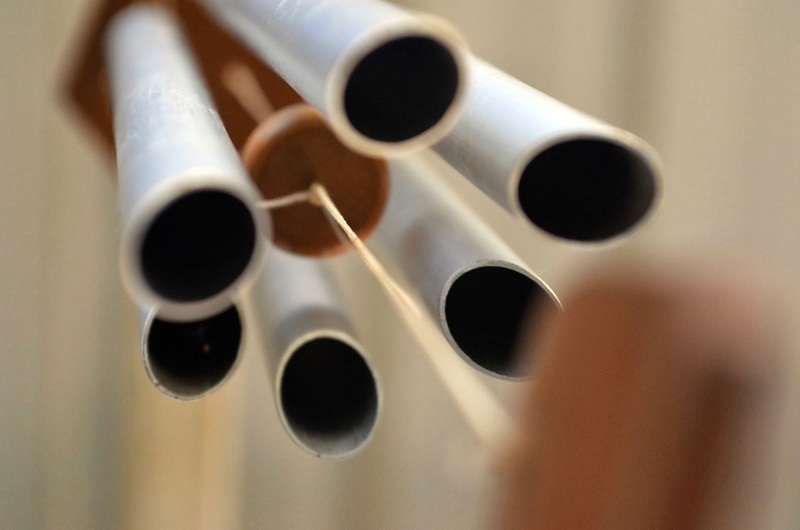 It's no wonder that many romantic poets and composers have found inspiration in aeolian harps. These sounds changed my landscape, once I stopped hearing noise. "I have listened to many refrigerators. 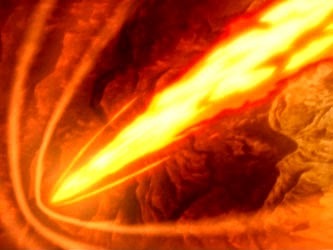 There is often a flickering between the sixth and seventh harmonic. Once... a refrigerator sent its harmonics out to surround my head with circles, ellipses and figure-eights." The 153rd Disquiet Junto is to “Record a short sound intended to be set on repeat”. 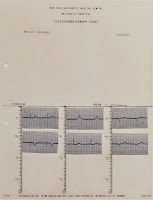 The image associated with this project by Stuart R Brown. One of my favourite loops comes from the chords opening Charles Mingus' cover of Mood Indigo. These two chords and a bit are the loop I'd like in a Buddha Machine. A bowl-like chime would also be nice, or maybe a wine glass or two in the key of D minor. My strangely named track 2 Go (Modern) is meant to reference Mood Indigo, with the brackets read first, like an e.e.cummings poem. 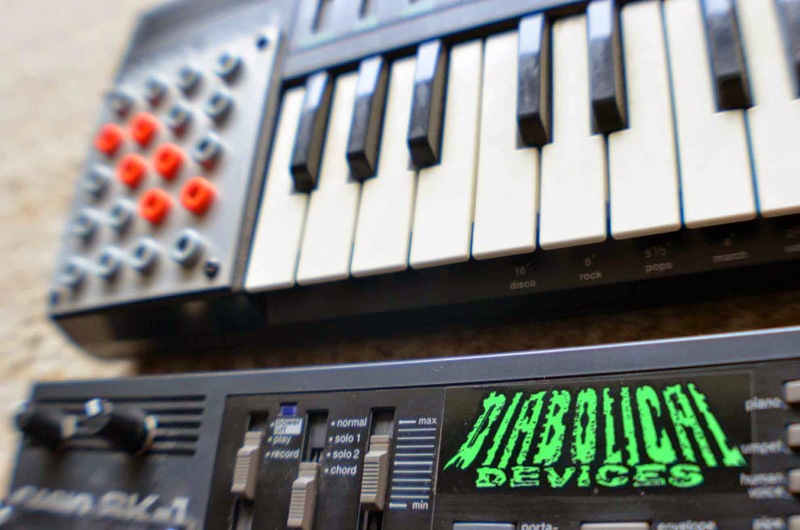 The synth sounds come from V-Station and Massive. I don't think it's as nice as the piano chords, which would also evoke the purple mood, but it's nice enough although Soundcloud don't offer me a repeat option. The loops on the Buddha Machine seem like a compositional challenge but it'd be great if they released a version where you could import your own soundtracks or select from a menu. The haiku shown right suggested a chase, so the pace of the music is brisk in response to the 47th Naviar Laboratory project this week. 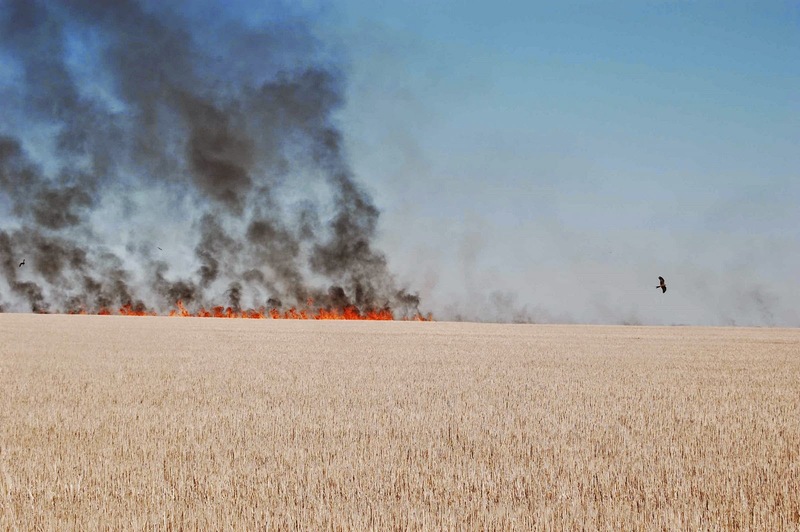 The image in mind while shaping the track was a raptor hunting among burning stubble. Visit http://hasitleaked.com/articles/mixtape-download-by-toydrum-for-kai-sunny/ to download a copy because it's great. So much vibe. 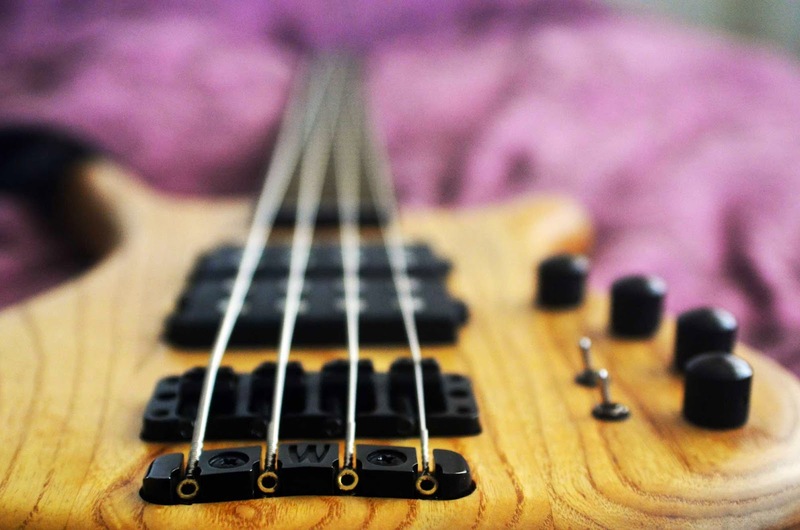 Since my new bass arrived this week, I've been slap-happy. The riffs in this track sounded a lot like a poor imitation of Primus when I first recorded it today. So I added a funk guitar part and then an airy synth. Now it sounds more like Talking Heads, I think. I've an idea for lyrics but my live-in vocalist is away at present, so they won't be added soon. 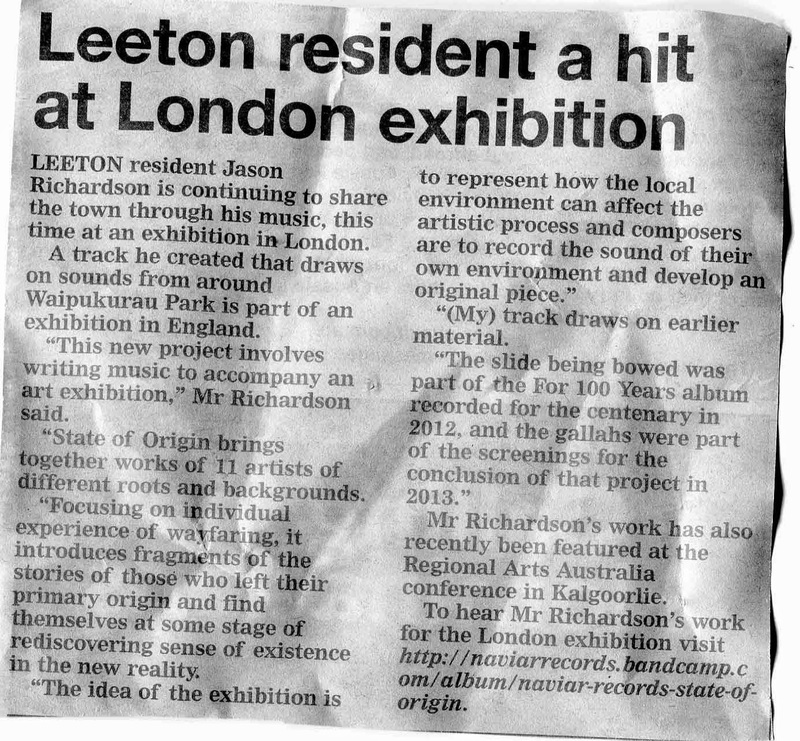 My local newspaper ran this piece this week on my recent contributions to the State of Origin exhibition and compilation, as well as my piece heard at the Regional Arts Australia conference in Kalgoorlie. Apparently the mysterious song of the Comet 67P/Churyumov-Gerasimenko has been floated as a likely subject of a Disquiet Junto project since it first was announced by the European Space Agency. The project this week was to cover this song. The comet recording suggested an Atari Punk Console, so I turned to my Dr. Blankenstein APC 2600. It's fun toy that I've had for a little while but not found reason to record. Once I'd recorded a take on these pedals, I used the volume and panning automation in Ableton Live to try better emulate the original recording. Then I used EQ and compression to try and get even closer to the orginal. Finally, I added further reverb in the form of UAD's Dreamverb for a darker character and automated the distance effect. Treated myself to a Warwick bass with my tax return this year. I've wanted one since I tried a friend's. They really are a nice instrument and it feels like it improves my playing. 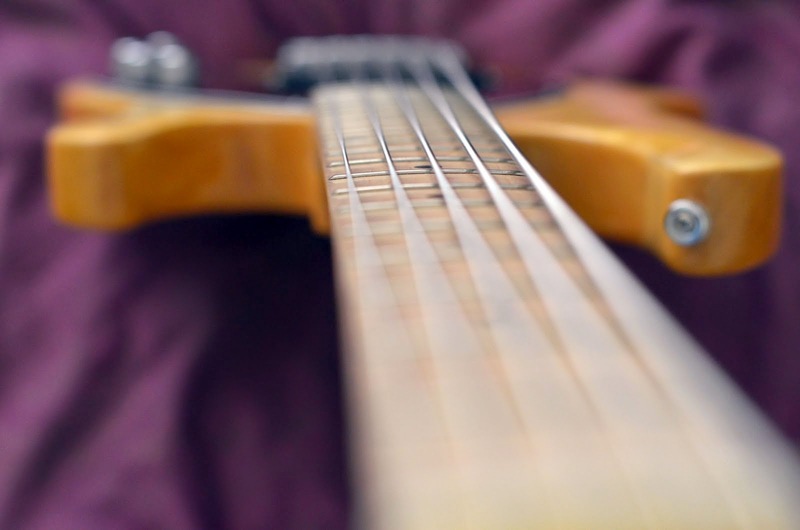 The drop D tuner is a nice addition and will help reach those notes I've been hitting since I bought a five-string. 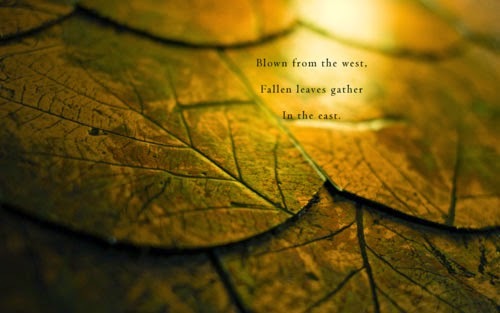 Today I recorded the bassline for my track 'Wandered' in response to a haiku poem by Yosa Buson, shown in the image on the right, which was another Naviar Haiku Project. 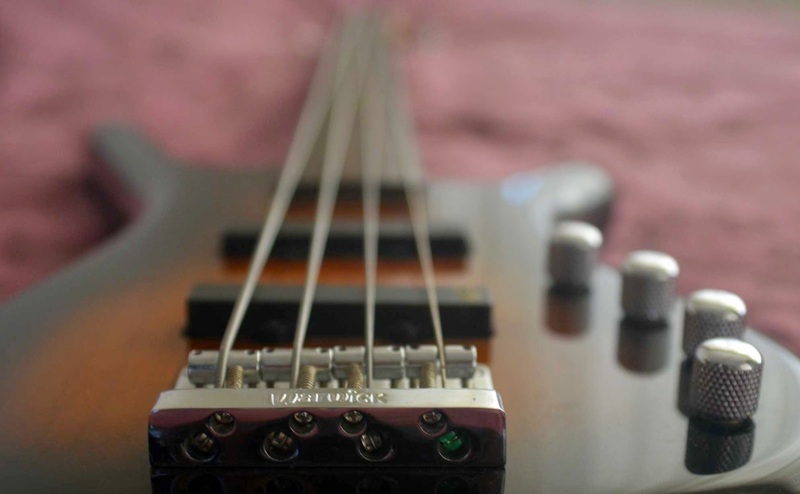 I used my recently acquired secondhand Warwick fretless 'Rock Bass' and a synth pad from Native Instruments' Absynth. The Disquiet Junto this week asked for a soundtrack to George Romero's film Night of the Living Dead using sound from within the scene being scored. After experimenting with a later scene, I settled on this earlier one for the knocking sounds and the telephone. Both were used for percussive effect. The drums come from the first couple of knocks looped, with a couple of instances of Ableton Live's Beatrepeat effect. The chord progression was created from the word "Food". The elongated vowel was suitable for looping, then I pitched it up and down to create the progression and ran it through a resonator. The crescendo toward the end is the result of the Valhalla reverb Shimmer. The bassline is the same loop of "food" but pitched down an octave and rhythmically gated. There's also another "food loop that's ran through Quad Frohmage. One small hurdle was ensuring my soundtrack led into the one that starts at the end. At first I thought it didn't matter, then decided it was a challenge I should meet. Music has entered the environment as an atmospheric element, like the wind, and in that capacity should not be subject to control and compensation. Well, not unless the rights holders are willing to let me turn the tables on it. If you think my listening is worth something, OK then, so do I. Play a Phil Collins song while I’m grocery shopping? Pay me $20. Def Leppard? Make it $100. Miley Cyrus? They don’t print money big enough. Bought this secondhand Warwick fretless 'Rock Bass' the other week. It's quite nice for the price, which was about a third of retail. There's a pleasing phasing effect when both pickups are balanced, like a subtle chorus. 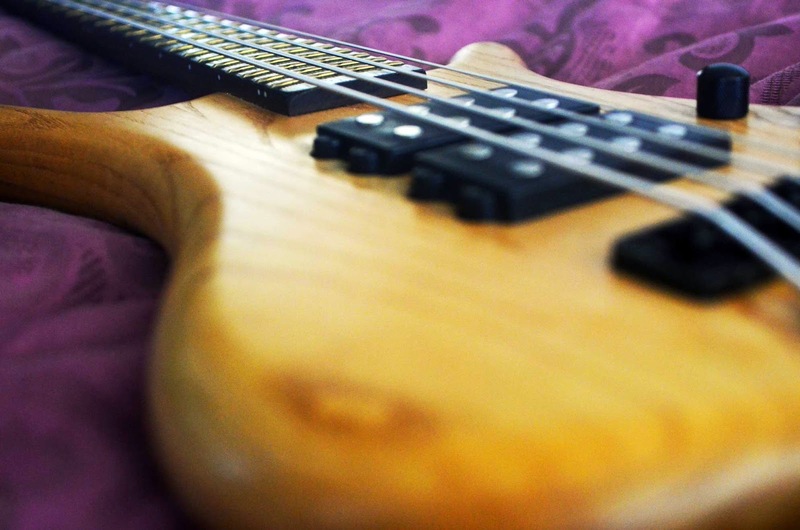 One drawback is it has created a desire for a fretted Warwick bass, which will be the subject of a future blogpost. Step 1: Consider the time you heard quiet music and didn’t know where it came from, only to realize you’d left your MP3 player running in your pocket. Step 2: Record a short piece of music with that as the intended purpose. That is, imagine a world not too far in the future when people regularly have a quiet music, a personal score, surrounding them, just as one might wear perfure or cologne. Step 3: Upload the finished track to the Disquiet Junto group on SoundCloud. Step 4: Listen to and comment on tracks uploaded by your fellow Disquiet Junto participants. I had the idea that, since male fragrances are often like a refreshing breeze, I should include wind noise in my track. As it's a personal score, I also included the sounds of the landscape in the form of birds. The track also had to have bass and I wanted something that wasn't too upbeat or too melancholy, settling on this old tune for the regal sounding chorus riff -- which seems kinda heraldic. This combination of bass and wind seems an appropriate statement as a regional musician. Music is capable of tapping directly into a particular phase of your life, and you can maintain affection for dreadful songs for years and years ('Extraordinary how potent cheap music is' as Noel Coward put it ). For recording musicians, the odd thing is that this time-frame is out of kilter, as the reality of an album actually exists in a period up to a year prior to its release. Interesting Junto this week, involving a field recording in the left channel and a processed version in the right. I experimented with recording at Waipukurau Park near my home on Friday night, before remembering that there was going to be lots of interesting sounds in town on Saturday morning. This weekend is the annual Leeton Outback Band Spectacular with marching and concert bands converging (and tonight merging). The main street had no less than three musical acts performing as I walked a short lap along Pine Avenue, starting and ending at the landmark Roxy Theatre. The processing for the right channel involved a couple of reverbs (Audio Damage's Eos and Valhalla's Shimmer) with Ableton Live's resonator effect using the 'Berlin' preset as a starting point. This is my 75th Junto and 20th video. The reason I choose this passage was it brought to mind an old field recording I'd recently used in the background of the first track on AND. It captured rain on a tin roof and seemed like it would suit. The tinnitus-like ringing comes from Absynth, as does the low note. Both are treated with a lot of reverb, some delay, as well as compression. 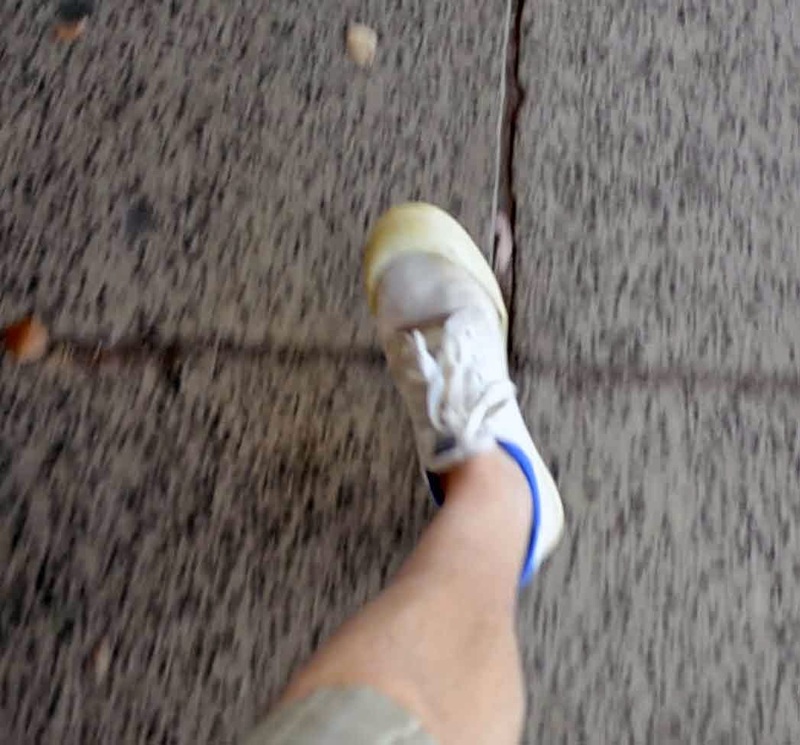 The Assignment: Record a piece of audio using sounds from your surroundings. The idea of the exhibition is to represent how the local environment can affect the artistic process: composers are to record the sound of their own environment and develop an original piece. The idea of being influenced by the environment has been a theme in my work for much of the last decade. Elsewhere I've discussed how the Wagga Space Program inspired me to consider this influence and how I started remixing field recordings, beginning with a remix for the Ninja.Trax project on their Ableton Live-themed compilation using samples I'd recorded for their field recording compilation. In more recent years I've been remixing playgrounds around Leeton for my For 100 Years project to celebrate the centenary of Leeton. Some of this material appears in this remix, specifically recordings made within my suburb Willimbong. Waipukurau Park has been the setting for many recordings and you can see the slide and swings, as well as fences and treetops in the videos here. 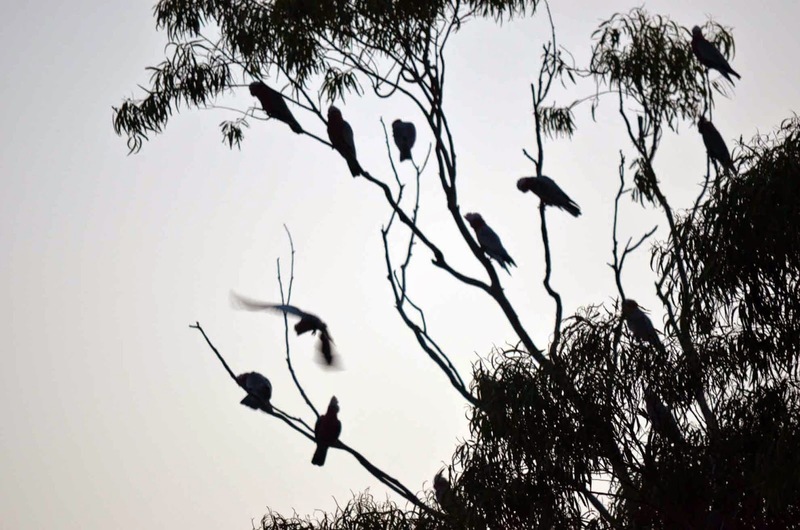 Willimbong has a mix of industrial and residential properties, as well as the Park that centres around River Red Gums. As well as birds like the noisy gallahs, the ambient noise includes the hum of the rice co-operative and trucks and sometimes I can hear the orange-juicing plant that is at the northwest corner of the suburb. This hum is buried in the remix but the gallahs feature and they are a sound I associate with Leeton, leading me to write and record the track Raucous Chorus. 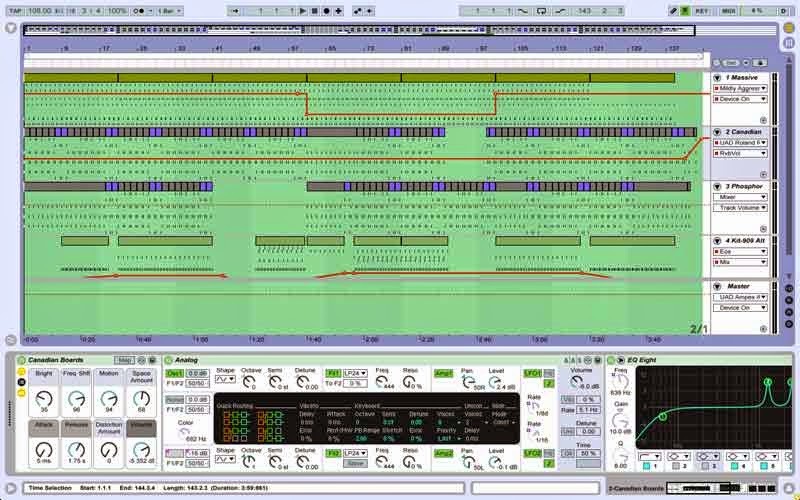 The final remix (above) was the fourth attempt at the track and includes Native Instruments' Absynth VST. Earlier drafts were more upbeat and used the same samples. Below is the third attempt, which I also like but didn't seem to be quite the right vibe for the suburb. I think I got a bit more of a Boards of Canada sound in the final version, using a tape-style delay for a bit of warble and an amp simulator on the drums for a bit of grit. Is kettle-tronica a thing? I ask because my last album also had a song made from a boiling kettle. 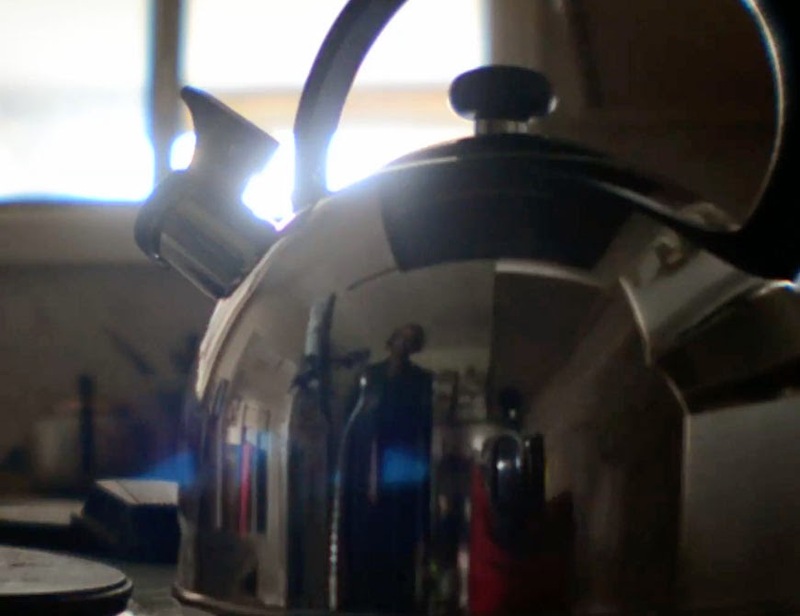 This track differs in featuring a kettle that whistles but, like the earlier one, uses only manipulated sounds from the recording to make the resulting track. Although, if you watch the video above, you'll see a finger snap and hand clap are used for percussion. This track closes AND because the whistling kettle causes some anxiety among tea-drinkers. I wonder if it doesn't also produce a Pavlovian response and they start salivating at the idea of a cuppa. Anyway, I thought it best to minimise the risk it would cause a listener to turn off the album. The title is a nod to the track Slow Boil on my first album, SHAKES. Alright, the penultimate track on AND is a remix of a story being read at my local library. 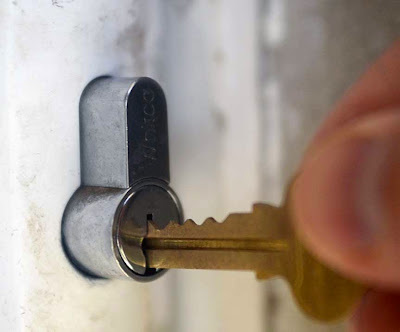 The Junto was in June and asked for the beeps which accompany checking out a book but the award-winning Saturday morning story sessions were what came to mind. It was an interesting exercise to remix a different kind of field recording. The sound of the story concluding leads into a remix of the material, with drones and a simple beat constructed using Ableton Live. The Junto only allowed for one minute of library and one minute of making something out of it, so on the album I've extended the track a little although I don't think it adds much to it. My partner reckons it's one of her favourite tracks and I wonder if this might be influenced by the familiar voices. Leeton is a small town, so I recognise Sandra the librarian and Cade, who shares a class with one of my kids. Track number 18 was inspired by the weather on a summer day, as part of the Sonar Vortex project for the Disquiet Junto in January this year. The track was recently heard at the Regional Arts Australia Summit in Kalgoorlie during the handover near the end when the next conference was announced for Dubbo in 2016. In the video above and the version on AND you can hear it is a bit grittier with Space Echo added to the bass than in the original piece embedded below. So, when I was finalising the album I went looking for tracks to put together. Above is a version of Bare Bones that was mashed with a Yellow Dog cover. Both were Disquiet Junto projects and this track nearly made the album AND but I wasn't entirely comfortable with my singing. 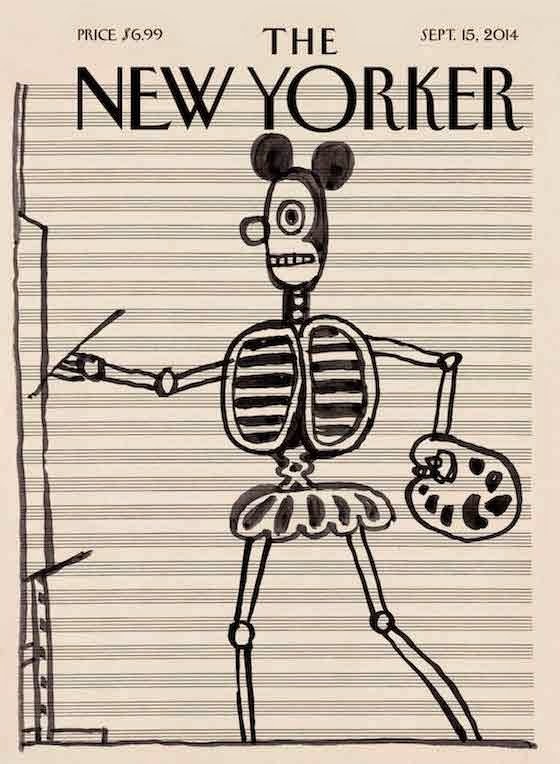 Bare Bones is the barebones of a funk track, recorded as an interpretation of this New Yorker cover by Saul Steinberg. Below is a video, showing that both drums and bass were recorded in single takes, which was a limitation I set myself for no real reason except to make making a video easier. Disquiet Junto 133 asked for a six-note song and this is what I recorded. The idea to layer three takes was an idea to create a sound more like that of a piano, as the three notes at the start are my favourites to play on a piano with heavy sustain to enjoy the decaying chord. The idea to "Record 8 seconds of white noise in your own personal style" comes to the Disquiet Junto via Taylor Swift, who was credited with an accidental eight-second noisefest on her recent album. My interpretation is a simple vocal rendition of white noise. I'd also considered collecting examples of white noise from my day, like the water sizzling when the percolator boils over or the sausages frying on the barbecue. You know, I think I might've found a track that needs more work. Listening back to this video makes me wonder if I might've overcooked this merging of two Disquiet Junto projects (107 + 115). Dunno. The original Junto asked for a track responding to the rhythms of wind chimes, which I think was something Aphex Twin has done but I'm not sure since Marc's book is more about the album after it's release than the background ( -- so this track sorta thematically follows on from Background Beats!). I ventured out to collect samples and also managed to borrow a nice set of chimes from my outlaws. Soon after a Junto asked for a performance accompanying a song in the next room. I played drums along to the wind chimes, although I didn't plan much for it and my timing drifts. A bit later I had the idea of combining the tracks. Then I made the video above, then I started putting together the AND album and it was suggested to me that my drumming drifted too much. This led to extensive editing and experimentation in making the drums better support the wind chimes. Did I go too far? There's something about the production that reminds me of a couple of Ninja Tune tracks circa Funkungfusion, I like that. 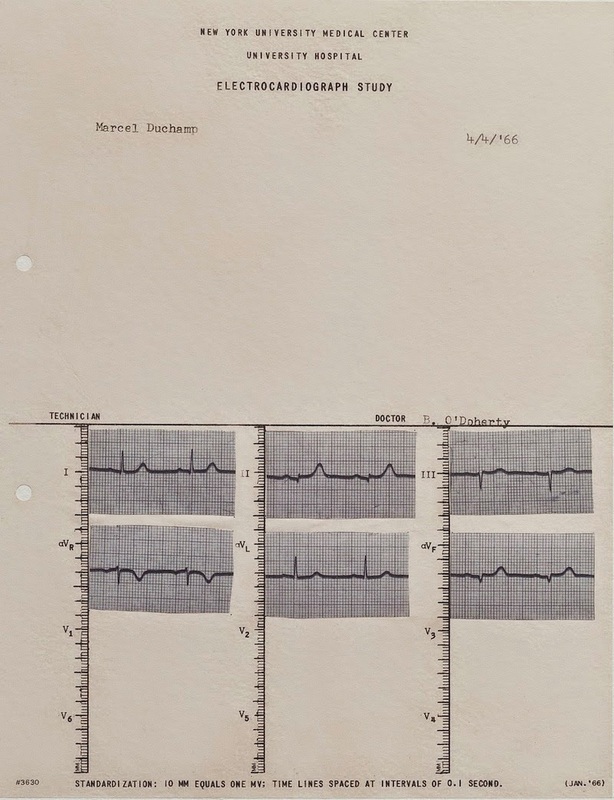 The track Background Beats on AND began as a cheeky Junto, using Marc Weidenbaum's text as a rhythm for an interpretive piece. Marc's book on the second volume of Aphex Twin's Selected Ambient Works was still in front of me from writing a piece for Cyclic Defrost. Sadly my composition is nowhere near the elegance of Aphex's works but I did use the idea of a background beat. In hindsight it seems kinda obvious to use the author of the Disquiet Junto. When I returned to the track recently, I started thinking about what could be added and settled on a text to voice speech. It was recorded through the closed lid of the laptop on the inbuilt mic. When I was finishing AND, I asked my collaborator Jo which of her performances she preferred on the album and was kinda surprised when she nominated this track. I can understand it sounds better, because my skills at de-essing seem to be improving, but for various reasons I prefer Raucous Chorus. The lyrics in this song had been sitting in my Gmail Drafts folder for a while. I started experimenting with delivering them over this C major chord progression, then recorded the chords for a Junto project which asked for a soundtrack to an art video. A little while later, there was a Junto asking for a cover and I decided the song I wanted to record was this one that I'd sorta recorded earlier. There wasn't much time to record the vocals. I think they would've sounded more polished if Jo had come back a day or so after learning the lyrics. Usually you can hear how much more confident a singer sounds delivering the material but, I dunno, the tentative nature of the lyrics seemed to be implied in this slightly doubting delivery. Elsewhere I've described the process of recording this song as "arse-about" but it worked out okay, I think. The atmospheric synths weren't my first choice for backing track but work better than the guitar part recorded for the vocal part. As mentioned earlier, the 10th and 12th tracks on AND are alternative versions. This one also appears on Album In A Day Vol. 8. The other version was recorded for the combined Naviar Haiku Disquiet Junto. I was chatting with Lee Rosevere around this time and he said he was busy with Album In A Day and encouraged me to consider joining. Plans had been made to go to Wagga, where I found time to record the riff I was riffing that week in a quiet spot under the house while my kids watched television. Unfortunately the gating on the version heard in the video is quite distracting. I think it sounds better on my album AND. Keith Cameron is a sculptor outside Lismore. I met him earlier this year while visiting an arts project at his property. 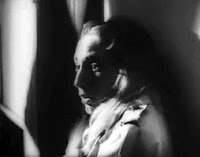 Cameron is shown at the beginning of the video for the track named after his work on AND, which is created from recordings made using a Rode video microphone and my Nikon digital camera. 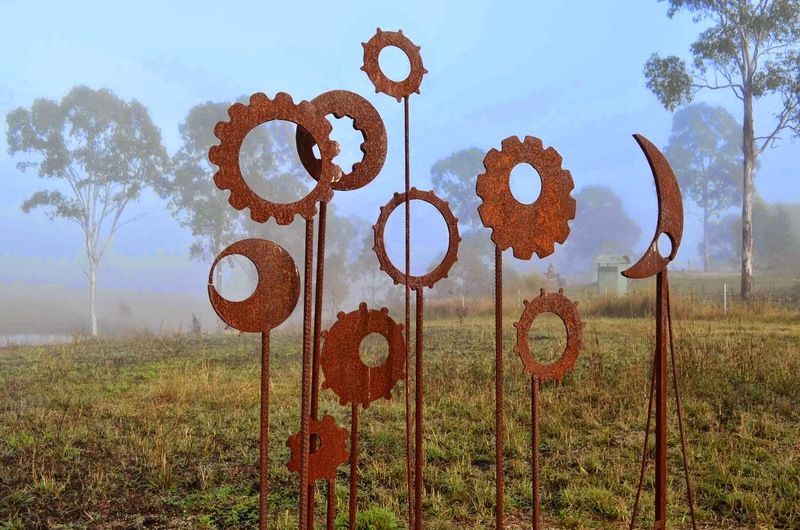 It was on a foggy Sunday morning that I looked at the numerous works on Cameron's property near Tabulam, nestled in the hills the lead away from Lismore toward the Great Dividing Range in Northern New South Wales. Some of the pieces were created from recycled machinery, others were structures built from various materials. It was quite magical in the thick fog, which lifted to reveal another sunny day. I like to think it's got an Amon Tobin sorta vibe. While this is one of the few tracks that didn't result from a Disquiet Junto, the material recorded at Cameron's property appeared in the loop used for a filtered melody. This week the Disquiet Junto asked for a short piece of music based on a symbol for the word 'silence' with this gesture outlined in the image. The word 'silence' brings to mind a story my partner tells of visiting an Italian chapel and hearing the word 'Silencio' broadcast loudly over and over without irony. At first I was tempted to record myself playing a short chord progression without plugging in the instrument, but I kinda wanted to make an electronic track. I chose to interpret the gesture through the rising and falling lines, which led me to pick up my fretless bass. The starting letter S was next to A so I started on A#. The next letter O is only a few steps below S but elsewhere the gesture seems to move backward, so I decided to go up a few steps in pitch to D then drop back to A because that would be a bit lower than the A#, right? And for ease I kept E as E, with a little dip down to C via C# since B seemed out of key. As the word 'silence' has seven letters, I chose to use a 7/8 time signature as I'm keen to explore alternatives to 4/4 at present. This led me to title the track 'Silence Over Solitude' as 'solitude' was the first sensible eight-letter word to come to mind. And the bell-like chimes remind me a bit of a chapel, I guess. Tracks 10 and 12 of AND are largely the same, in terms of composition. 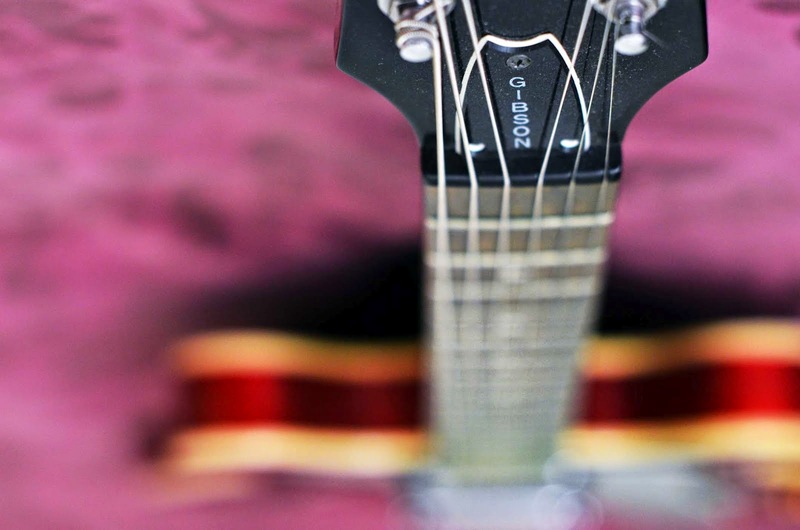 In terms of production, the former is electronic and the latter is performed on acoustic guitar. This song was recorded as a response to a haiku and the instrumentation aims for an icy effect. The percussion is meant to emulate the crunching of footsteps, and the reverb (of course) a cathedral. Seems strange it was only March this year that I first encountered the Naviar Haiku project. As I recall, I'd signed up for their updates and it coincided with the Disquiet Junto adopting it for the week. This composition for bass was a response to a Junto in the lead-up to last Christmas, asking for a sonic equivalent to tinsel. It's not the most obvious response but it was, once again, a good excuse to record a riff. The Junto's limitation on length gives it brevity but the version on the album AND adopts the idea of looping the piece, so it's almost twice as long. I recall that originally it was a more measured series of arpeggios but at the last minute thought I should give my playing a bit more groove. This last take had me grooving in my seat but it was especially encouraging that my neighbour's kids were also in the kitchen and dancing as I recorded. 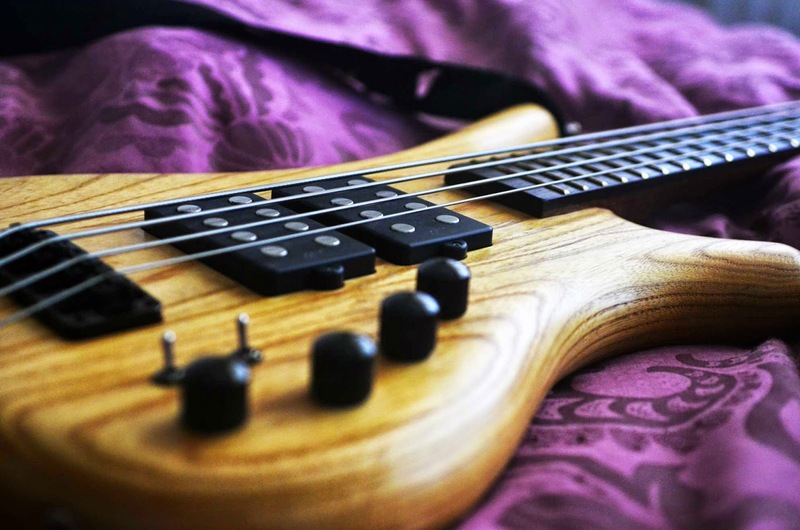 The flatwound strings on the bass give it a beautifully dark and woody tone. The Disquiet Junto has an annual exercise which involves recording ice in a glass and making something of it. 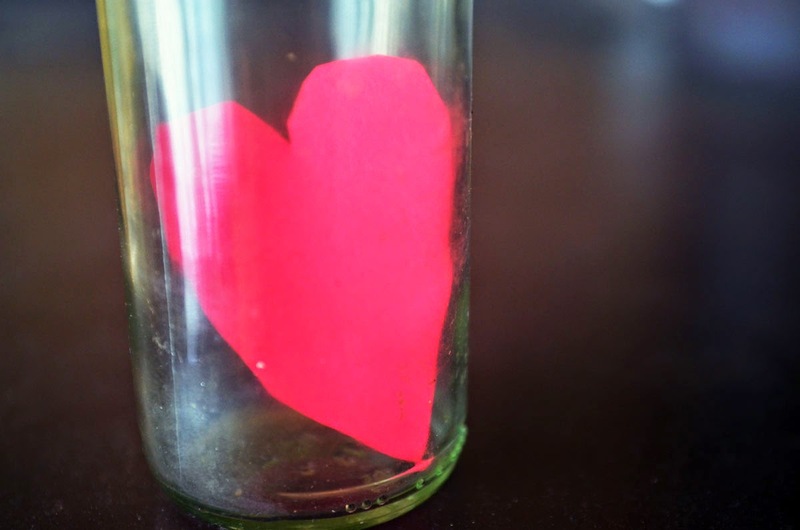 On my previous album WHILE, the ice-in-a-glass track is Solitary. On AND it's Chilled Glasses. This year, as you can see above, I made a video showing the ice cubes and glasses that supplied the sounds. I'm happy with how different these two tracks sound, now that I've compared them. I remember Solitary was a deliberate decision to do something less percussive because I'd been making similar sounding tracks at that time in 2013. In 2014 I was returning to making sample-based music after one of my increasingly regular flirtations with bass guitar or drums. The video-making drew on the techniques I'd developed during the FOR 100 YEARS project, particularly using Ableton Live to edit footage that's then composited together in Motion. The seventh track on AND is a personal favourite. The track was recorded for Naviar Haiku but, like many, it really was just the excuse to record the riff I was riffing on that week. The haiku started me thinking about roosters and I ended up thinking about Westerns. It was a bass driven riff but the aesthetic chosen by the gunslinger image really shaped the result. I recorded the guitar and then the drums, which aren't the strongest but mostly work. For a while the track didn't seem to sit right and then, when I was re-exporting for the album, I changed the reverb and it seemed to all fit together properly. That was an interesting experience, hearing how my perception shifted. “I forget who first phrased this concept, might have been Bob Olsen,” said Lucey. “Everywhere in the production process, there’s some harm introduced to the audio. The goal is to gain more than you lose at every step. “This might make me sound crazy, but I believe all the potential music in the world exists somewhere in this place of silence. And the artist hears and draws something from that silence and gives it a voice. At first it’s kind of raw, it might be a hook or a verse line, but it has potential. “Then the next step is arrangement; they take that inspiration and structure it in a way that connects with more people without losing the original inspirational intent. That original rawness is lost to some extent, but they’ve arranged it in a way where you or I might get what they mean. “You go in the studio. Let’s say it’s the new U2 record and they want to record live because they can. The result is never as cool as being in the room, something was lost, but something was gained because now we have a recording. This is a song about Marcel Duchamp, arguably one of the most influential artists of the latter 20th Century. Specifically this -- the sixth song on And -- is a song sorta about his heart rate at rest. Once again this is a track that was recorded as part of a Disquiet Junto. 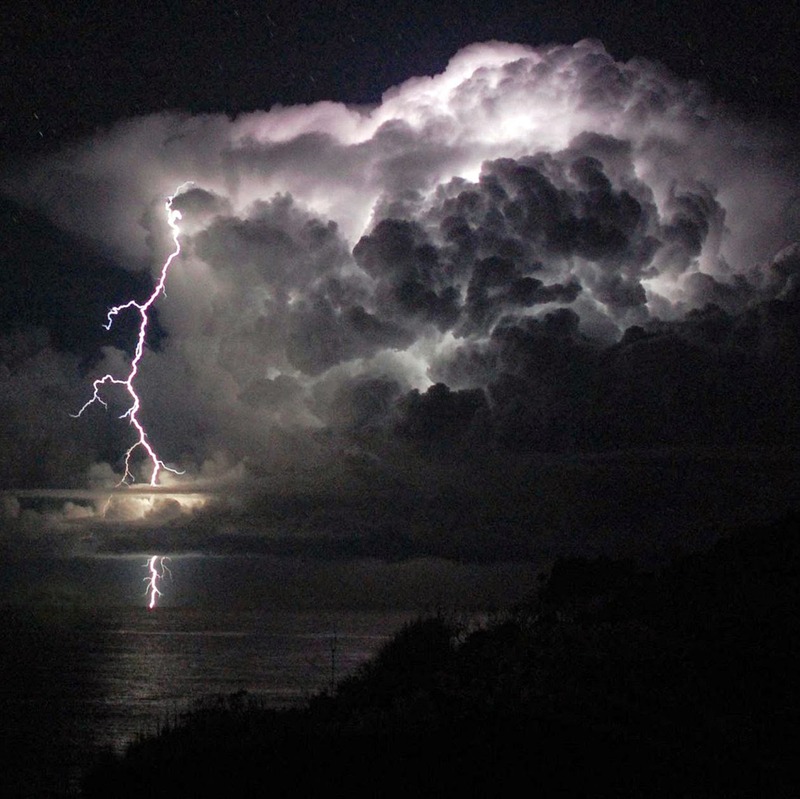 As I recall it was written in Ableton Live while on holiday at Valla Beach, which is where I shot the lightning bolt shown on the cover of the album AND. The album version differs from the Junto draft, the drumbeat is less obviously different since vocals now dominate the track. Voice wasn't an obvious choice but, like Wind-up, I was thinking about Andrew Weatherall's advice to producers. 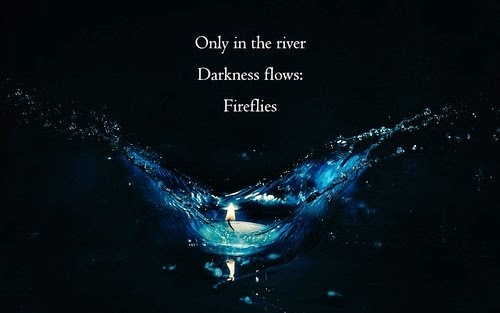 This week the Disquiet Junto asked for a track inspired by a haiku. 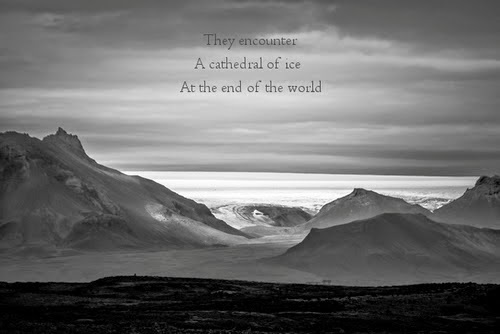 Image shown with Marc Weidenbaum's poem is by Geir Tønnessen. This morning I recorded the two clicks of a screen door lock. Then I worked on a few riffs that showed promise. Then I decided I was being too literal in my interpretation of a track inspired by the poem shown above. Then I remembered the track I'd started making last night. It was sorta inspired by the riffs I've been riffing but for some reason I decided to try a 3/4 time signature. I think the deep-ish house track is now a waltz. Is waltzhouse a thing? There are only a few parts. The bassline started as an accordion, then in a later draft I started using an analogue-flavoured preset in Massive. 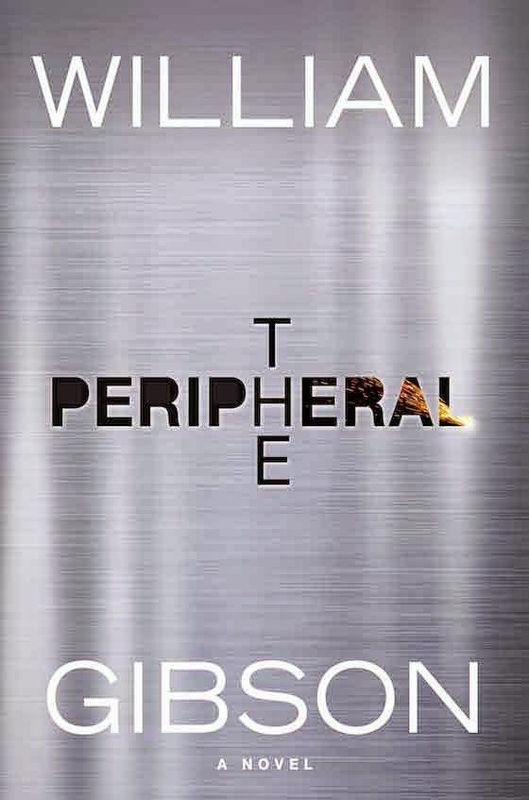 The chord progression is mirrored on Operator and Phosphor synths. The drums were originally 808 but I swapped for one of Ableton's 909 kits later. I think the dance-y direction this week was influenced by listening to dance music last weekend at Burning Seed, particularly a psytrance-y set at dawn on the morning of my birthday. That was pretty cool. The fifth track on AND was written in 2013 on the way to concluding the For 100 Years project, which celebrated the centenary of Leeton. You can hear an early version of the song Raucous Chorus in the material screened around town in July that year. 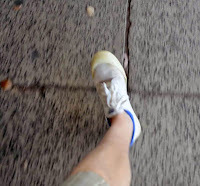 At that time I wanted to add vocals to one of the 'parktronica' tracks I'd recorded and had asked a vocalist to contribute to a track created from recordings at their local park in Wattle Hill. In the end it didn't happen with the vocalist but I'd come to hear my partner Jo's voice in the track. The lyrics were inspired by my partner's observation that gallahs are a sound she associates with Leeton. Jo has been visiting this town all her life, as she has family here. Once I started thinking about gallahs I found a lot to write about but it was mostly informed by the comments that she's made about these social birds, including how you can spot the flocks of offspring in contrast to pairs of parents -- which I wrote a haiku about a while back. The version of Raucous Chorus on AND is an acapella over recordings of gallahs roosting. I made the decision to drop the backing track made from Gossamer Park (hear it here) for technical reasons but it also seemed a good idea to increase the variety of material on the album. Back in 2012 I stopped in Hanwood while driving home from Griffith and discovered Restyn Park. 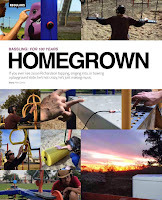 I'd been recording playgrounds in Leeton for my For 100 Years album and was looking for interesting equipment, so the circular shapes on the metal climbing frame caught my ear. Later that year I returned to Restyn Park to record the playground. 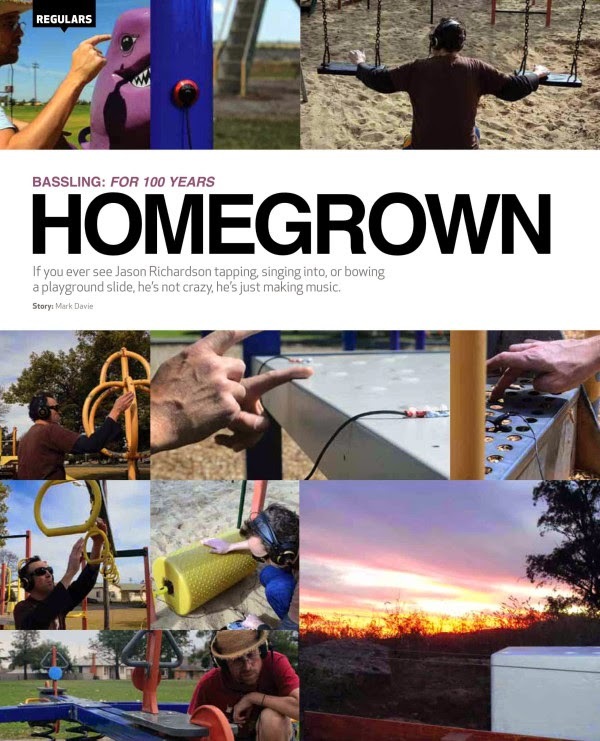 Images were used in an article in Audio Technology but I didn't do anything else with the recordings because I was a bit over manipulating playgrounds. I got back into it in 2013, at the close of Leeton's centenary when I screened work around town, but the files for Restyn Park remained on my desktop. Earlier this year a Disquiet Junto asked participants to share a technique and I thought to use the sounds from Hanwood to share my Parktronica, IDM made from playgrounds using contact microphones and Ableton Live. There are a few subtle differences between the initial version of the song Restyn Park in the video above and the AND album version below. A lot of lower frequencies were cut out and an effect on a buss adds a squeak like an old rusty swing, which is actually a sound I'm very fond of and appears on a couple of albums now. The third track on AND has been described as "Electro Black Flag" for infusing a punk-ish electronic track with cut-up lyrics. It was a Disquiet Junto exercise using William S. Burroughs as inspiration. 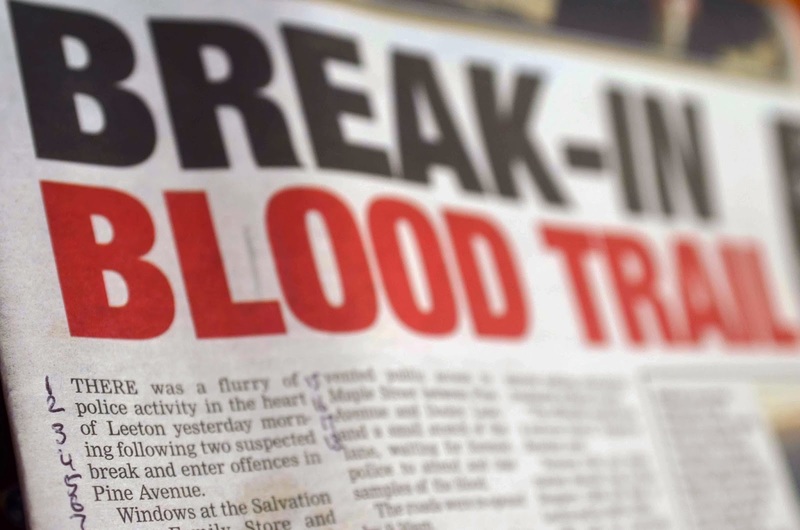 The lyrics came from a front page story in my local paper The Irrigator and, using a formula promoted by the Junto, arranged the text into a new shape. Using these words, I experimented with different backing tracks until the result seemed appropriate. While it was recorded very quickly, the result has generated many positive comments. I've been thinking I should try an album of songs using this approach. The second track on AND is Dust Devil, a dynamic instrumental performed with guitar, bass and drums. It stayed pretty much the same as when it was recorded for a Naviar Haiku project earlier this year. 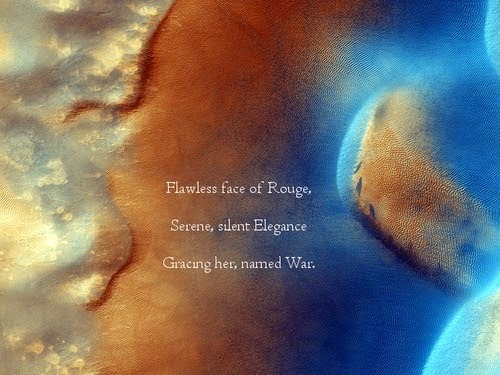 The haiku above was about Mars but the image I had in mind was the desolate landscape of the planet. The funky intro riff was something I wanted to use, so I began imagining watching that dusty landscape and arrived at thinking about a whirly-whirly. I can see a cloud of dust dancing to this track, kinda erratic in the distance at first but then thrashing about around you. It was tempting to add distortion to the guitar near the end of the track but the cymbals seemed blistering enough. I think I probably would've done more to develop this track if there hadn't been an issue with the files. As it is it's fun enough, so I just worked on EQing it to sound okay in the car stereo. Actually, one of the biggest learning curves while mastering AND was listening to the album in the car. Suddenly I realised the inaccuracies in my studio monitor speakers, particularly in reproducing lower frequencies. The first track on AND is Wind-up. It started like many, a composition recorded for a Disquiet Junto exercise. It was only May this year and the idea was to create a soundtrack for a fake movie, a kinda kids horror film inspired by bad video games. My own inspiration for this piece was the Poltergeist Theme and I remember it was quickly written and recorded on a Sunday. It seemed a good opening track as soon as I started collecting material for the album but it needed something. 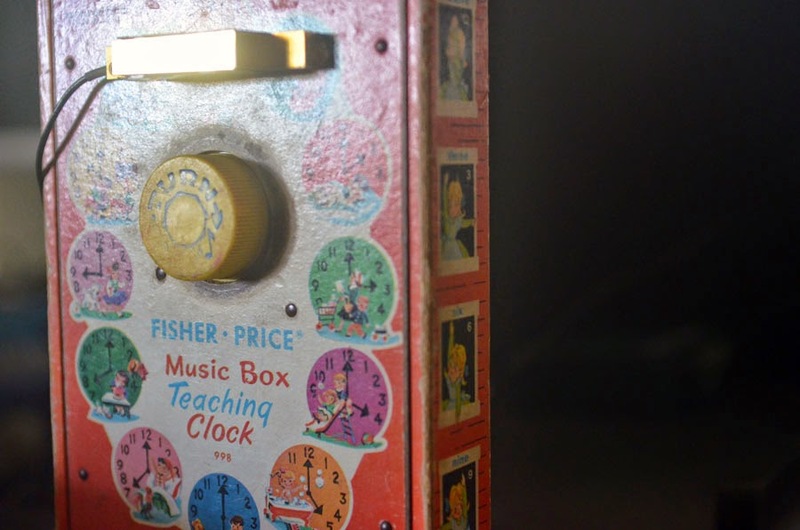 I added a field recording and was looking for something else when I remembered the Fisher Price Clock recorded to try out my then new contact microphone. Ableton Live time-stretched it to fit the track and, once I'd adjusted the key, it seemed to fit perfectly. I think the idea to look for something else came from reflecting on this advice from Andrew Weatherall. You'll hear that there's a lot of variety, from funky instrumentals to electropunk with cut-up lyrics and a few songs featuring the voice of Jo. There was a lot of material to choose from, with tracks made from storytime at the library, a boiling kettle as well as a playground and then an assortment of instruments. I'll write something about each next month. See above for a playlist of 13 videos for some tracks from AND, my collection recorded 2013-14. Busy weekend this week but I found time for my 70th Disquiet Junto. Instructions were to record a live duet with the world outside my window and the best sound seemed to be that of a lawnmower. Lawnmowers are a very suburban sound and a couple of my neighbours are very regular about maintaining their lawn. 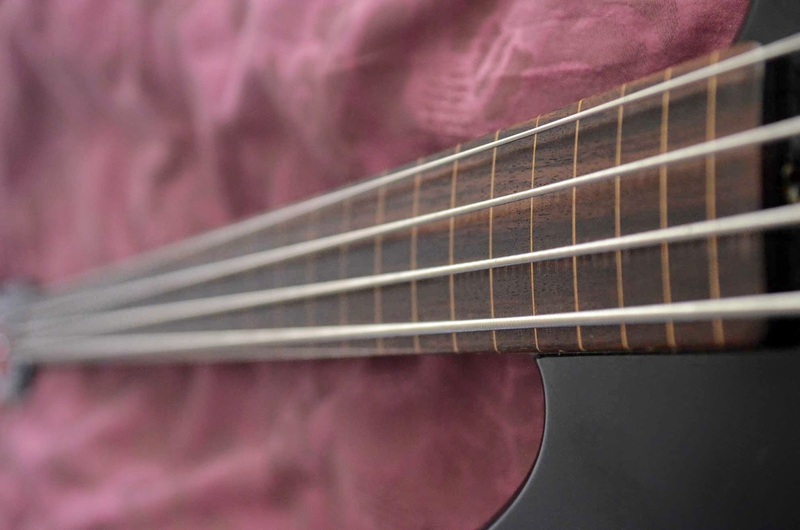 I was lying in the bath when one started on Saturday morning, so I cut short my wash and picked up the semi-acoustic bass. The engine drone seemed to be in A and I tried a couple of ideas, settling on a rhythm and then an arpeggiated chord progression that I'm fond of playing. You're brainwashed in the West with equal temperament, so it's quite hard for people who like following rules to get outside of that and see what you can do. But for me it's easy because I don't work like that. I work intuitively. 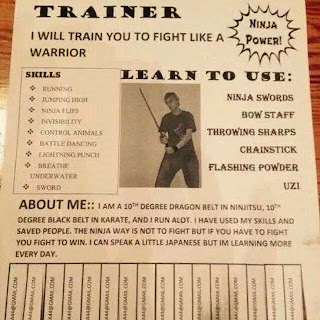 I actually prefer it if I don't know what I'm supposed to do. If you've got an equal temperament piano keyboard, then you know what you're going to get if you play certain chords. But I actually like it if you don't know where the notes are, because then you do it intuitively. You're working out a new language, basically. New rules. And when you get new rules that work, you're changing the physiology of your brain. And then your brain has to reconfigure itself in order to deal with it. So if you hear a C-major chord with an equal temperament, you've heard it a million times before and your brain accepts it. But if you hear a chord that you've never heard before, you're like, "huh." And your brain has to change shape to accept it. And once it's changed shape, then you have changed as a person, in a tiny way. And if you have a whole combination of all these different frequencies, you're basically reconfiguring your brain. And then you've changed as a person, and you can go and do something else. It's a constant change. It could sound pretty cosmic and hippie, but that is exactly what's going on. Filmed a lava lamp tonight, added a solarisation effect and BINGO! A film clip for a song about the weather recorded for a Junto in January. 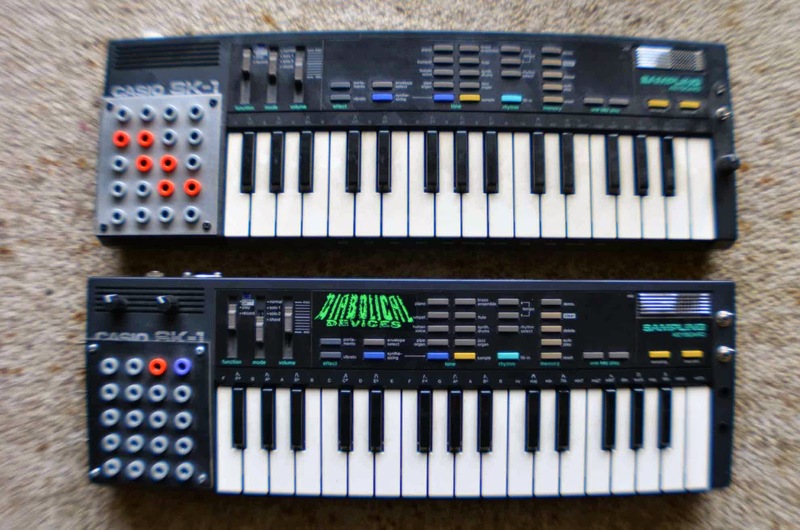 Bought a second Casio SK-1 modified by Diabolical Devices on Ebay and it arrived today. It was going cheap so I couldn't resist. 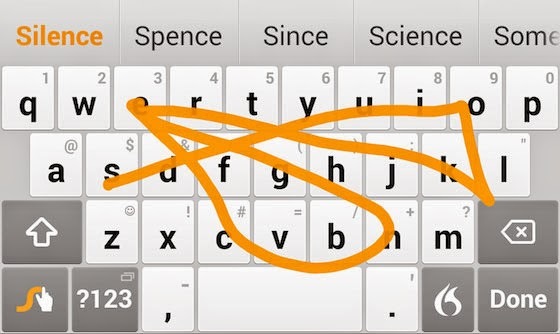 I was surprised to discover the bends are very different between to two keyboards. 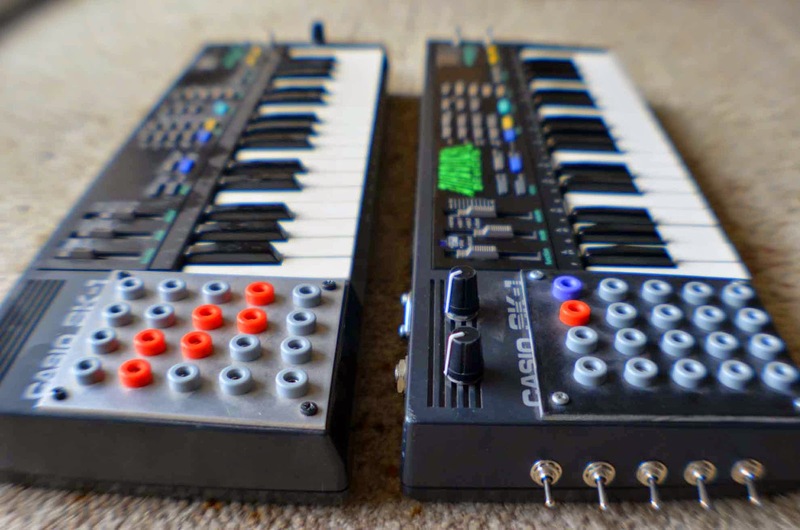 Both have MIDI and mini patchbays but that's where the similarities end. The new purchase is shown below and the switches on the right-hand side control the patches if you use the coloured sockets. In comparison the switch on the older purchase controls a pitch variation knob, producing nice warbling vibrato effects. The switches on the left-hand side of my new purchase can glitch the rhythms, both the keyboard chord basslines and the percussion. It worked better on the former than the latter, which froze and required resetting by turning the machine off and then on.